A key part of this plan will require the assistance of an explosives expert. Enter Joe Bang (Daniel Craig), a man willing to help - for a price. All the Logan brothers need to do is break him out of jail. The return of Steven Soderbergh from (four years of) ‘retirement’ was warmly welcomed by film fans - particularly following news that his next film project involved a heist - a genre the director of Ocean’s 11 (12 and 13) knows all too well. While more 7-Eleven than Ocean's 11 (as the film itself concedes), Logan Lucky is an entertaining ride that explores themes (such as healthcare liability and unemployment) more relevant to much of American society today. Logan Lucky features an impressive and hugely likeable cast (almost all of whom nail their wonderful accents). Channing Tatum is charming as Jimmy - particularly in the scenes with his daughter, Sadie (Farrah Mackenzie). 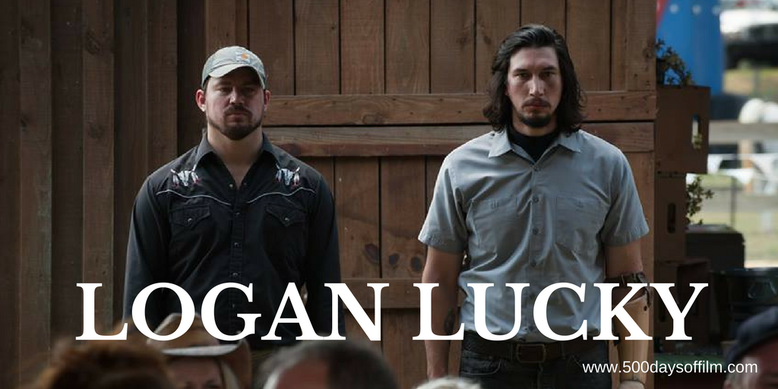 Meanwhile, Adam Driver is brilliant as Clyde - a bartender who lost part of his arm while serving in Iraq and who is convinced that the Logan family is living under a curse. Driver brings so much to Clyde - the film comes alive every time he appears. However, stealing every scene, is Daniel Craig with his fabulous portrayal of Joe Bang. Almost unrecognisable with bleached blond hair and eyebrows, Craig has such fun with this eccentric (possibly psychotic) character - he is an absolute joy to watch. Sadly, given these performances, Logan Lucky suffers from many flaws. For example, the story's pacing is slower than in the Ocean’s films for good reason. However, the movie fails to catch light in its final act - it feels overlong and there's no sense of adrenaline, no final thrill. In addition, Soderbergh’s film is stuffed full of characters. The supporting cast list is impressive - featuring Katherine Waterston, Sebastian Stan, Macon Blair and Hilary Swank among others - but there is just not enough room in the story for them all. In addition, don’t get me started on Seth MacFarlane’s awful portrayal of Max Chilblain - complete with his terrible London accent. Both obnoxious and unfunny. While I enjoyed spending time with many of the characters in Logan Lucky, overall this film feels like a missed opportunity. And that is a real shame because it certainly had the potential of being a superb heist movie. According to the Logan Lucky website, the film’s original screenplay is by Rebecca Blunt. Uncorroborated rumours suggest that this is a Soderbergh pseudonym. Who knows if this is the case. However, it certainly wouldn’t be the first time that the director used an alias. If you have, what did you think of Steven Soderbergh’s film? Let me know by leaving me a comment in the section below or come and say hi over on Twitter or Facebook (@500DaysOfFilm)!